Home ACCESS Bali Horwarthhtl Report STR Global Hotel & Branded Residences Bali Part 1 Quantity over quality: be careful what you wish for. 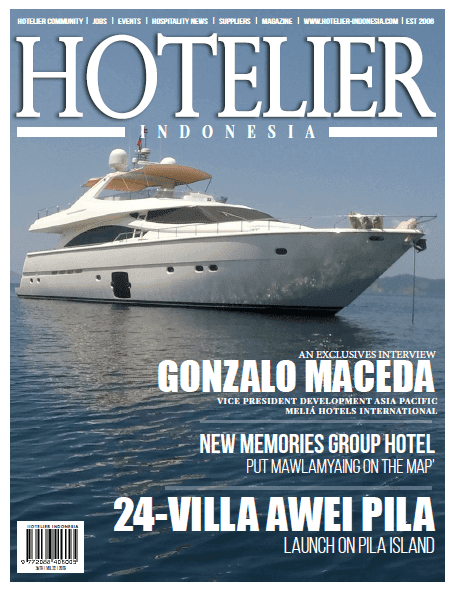 Hotel & Branded Residences Bali Part 1 Quantity over quality: be careful what you wish for. Quantity over quality: be careful what you wish for. After a very challenging 2015 for Bali, occupancy was up by more than 4% in 2016 bringing a whiff of fresh air and hope… but at what cost? Hotels’ enjoyment of solid occupancy across categories (excluding luxury) was driven by increasing foreign direct arrivals, a slowing in new hotel openings and a further slashing of rates. With the Thai government banning ‘zero- dollar tours’ this has been an opportunity for Bali to swoop in and attract these poor yielding groups to fill rooms. With the government’s ambitious arrivals targets, it is foreseeable that the volume of such tourists is likely to increase but the long term benefits to the destination are arguable. Rates will continue to decline, Bali’s infrastructure will continue to be stressed and higher yielding more discerning guests may be turned off. It is a tight rope that is being walked with a quantity over quality policy. With the explosion in budget accommodation, private villa rentals and huge numbers of new rooms in all hotel categories in the last 5 years it is easy to see how volume bums in beds relieves immediate mortgage pressures for hotel owners. However, hotel ownership and destination management is not a short term game. Nurturing a destination, the maintenance of infrastructure and the development of long term sustainable development goals are essential to ensure Bali continues attracting people from all corners of the globe and across all rate categories. 2015 recap: domestic market up 12% y-o-y to around 7.1 million and foreign arrivals also up 6% y-o-y to 4 million bringing the total to over 11 million for the first time. Foreign arrivals surged year end 2016 up by a significant 23% to 4.9 million. 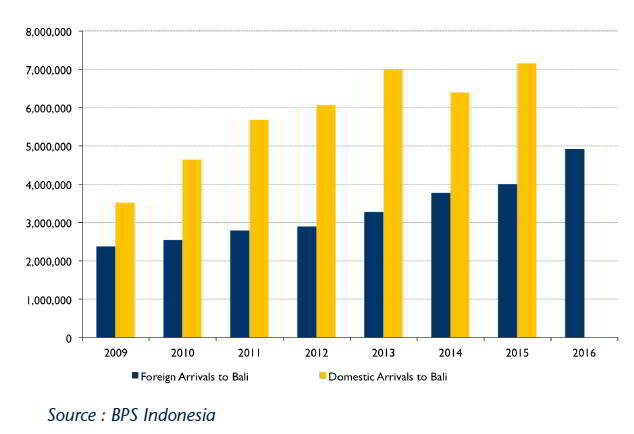 This was helped by the lack of political and natural hiccups, visa-free access ramping up and more direct flights to Bali which smashed the 4.2 million arrivals’ target for 2016. With Indonesia’s central administration continuing their efforts to attract more foreign arrivals, the government boosted the Ministry of Tourism’s budget from IDR 300 billion in 2015 to IDR 6.1 trillion in 2016. It is understood that around 80% of the budget was allocated for tourism promotion, and partly to finance tourism campaigns abroad. The island is expecting another boost in air connectivity from Garuda Indonesia in 2017. As China’s importance as a source market grows overtaking Singapore, Malaysia and snapping on the heels of Australia; Garuda Indonesia plans to open a new route from Bali to Chengdu in China. The direct flight will start in January and is scheduled to fly four times a week. In an effort to tap into this vast and growing Chinese market, Sriwijaya Air has also confirmed four main cities will be added to their daily flight routes: Hangzou, Nanjing, Wuhan and Changsa. The Ministry of Tourism has also recognized Eastern Europe as an emerging market to Bali with increased arrivals recorded, assisted in part by LOT Polish Airlines launching direct flights from Warsaw to Denpasar in 2016.